Our quality Cadillac neon clocks are fitting tributes to one of the most popular cars in the world. For almost a century, General Motors has distinguished itself as the producer of the sought after, luxurious Cadillac. Even during the Great Depression, people were willing to go the extra mile to be seen in one. For a long time, the manufacturer stood by a design of big, strong, gas guzzling, muscular bodies. They streamlined the design, aligning it with evolving trends and consumer tastes, without compromising its status as one of the most lavish vehicles on the market. 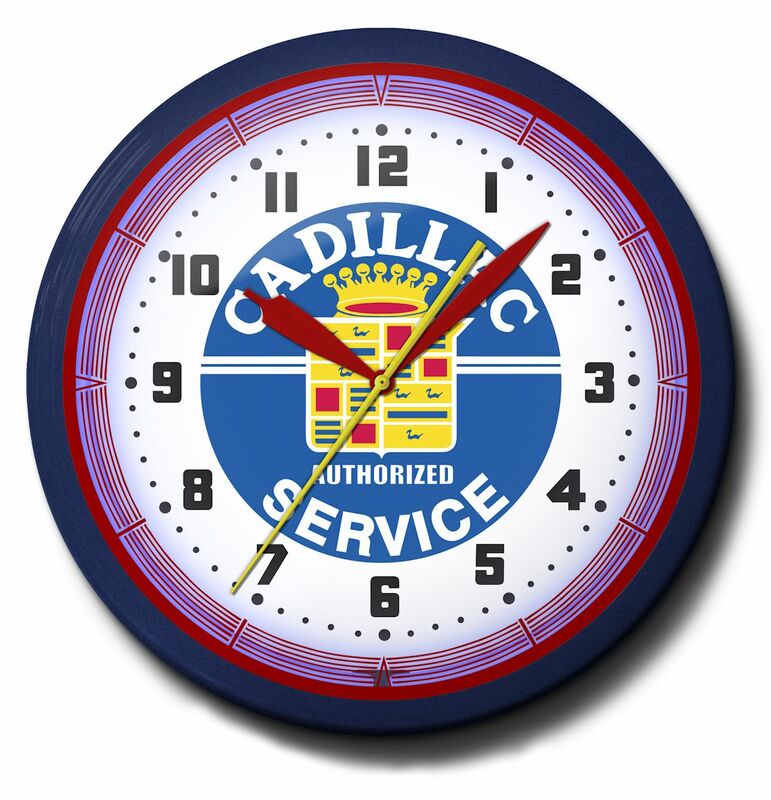 The first of our quality Cadillac neon clocks features the classic Cadillac Authorized Service that adorned many an auto shop wall once upon a decade. Its distinct design was captured using a CNC router to ensure the image retained its colorful qualities. It was then engineered for a clock face utilizing a controlled UV dried computer printing process for accuracy, assuring colors and detail hold up for years to come. The same process was used for the Cadillac Wreath clock. This is the current logo with the traditional Cadillac colors and surrounded by a silver wreath. That color was specifically chosen to suggest the car�s elegance and advanced technology. Not everyone can afford a Cadillac, but we can all have this time piece on our walls. Its neon glow will add a nice charm to any garage, shop or business, and show everyone that looks up you know class when you see it. 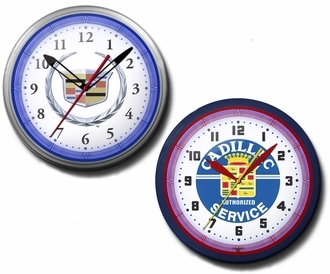 The quality Cadillac neon clocks will make excellent decorators for the car enthusiast or professional mechanic. Or gift a clock to that one person in your life (doctor, lawyer) that�s driving around in one anyway. They�ll get a giggle out of it and maybe they�ll return the favor by handing you the keys. Fair trade.